Habitat for Humanity of Martin County has served our community for the past 30 years, partnering with over 126 families who live, work and play in Martin County, and are now proud homeowners. Our families work side by side with volunteers to build their own homes, and, in return, we provide them with an interest free mortgage. We offer a hand up, not a hand out. Every year, the women of our community come together to not only completely build a Habitat home by themselves, but also raise the funds necessary to build that house, $105,000 for the hard construction costs. Mr. Stud Finder is a live auction led by a professional auctioneer whereby all funds raised go directly to our Women Build Home. Each year, this event has gotten larger and larger. Prestigious businessmen and esteemed professionals donate their time and talents to benefit the Habitat for Humanity Women Build Program. Some of the auction packages in the past included rounds of golf, tennis lessons, river tours, gourmet dinner from a personal chef, artwork from local artist and a personal meet and greet with Burt Reynolds. 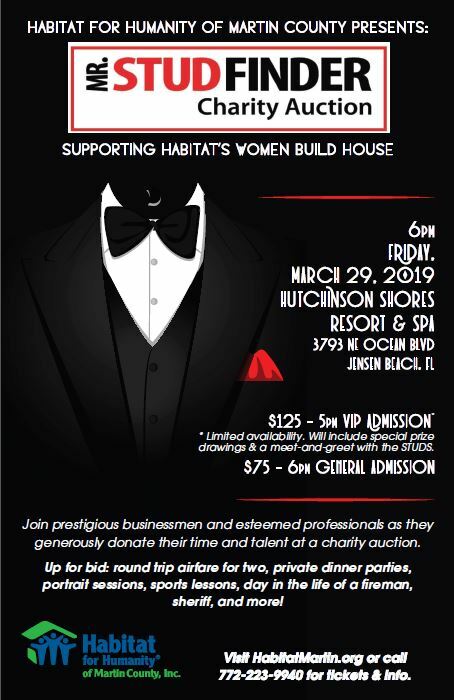 The next Mr. Stud Finder Charity Auction will be held on March 29, 2019 at Hutchinson Shores Resort & Spa in Jensen Beach, featuring a cocktail reception with both silent and live auctions.